The cool graphic below shows how the act of yawning is said in 6 different languages: English, French, Thai, Korean, German and Japanese. Surprisingly, after English and French, the Korean and the Japanese are the ones that made sense to me the most! It is noteworthy that the verb “yawn” translates to “تثاءب” in Arabic. I love such graphics. They’re fun, educational and straight to the point! I’m not really into reading so this is why I find learning like this a lot more interesting to me. I’m more of a visual learning fan. 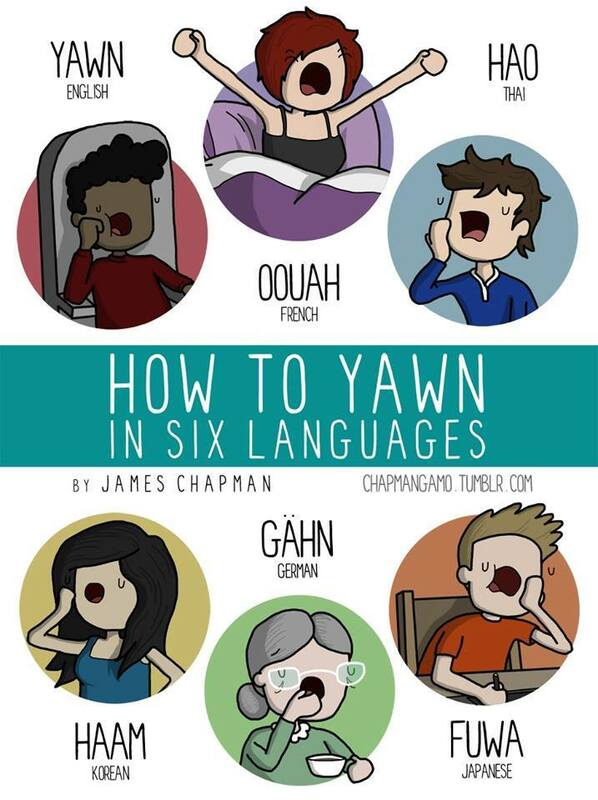 How do you yawn in your language? I’d really like to know if it wasn’t among the above list! Very interesting Thx for sharing! Great post! I wish there were more languages added to it!